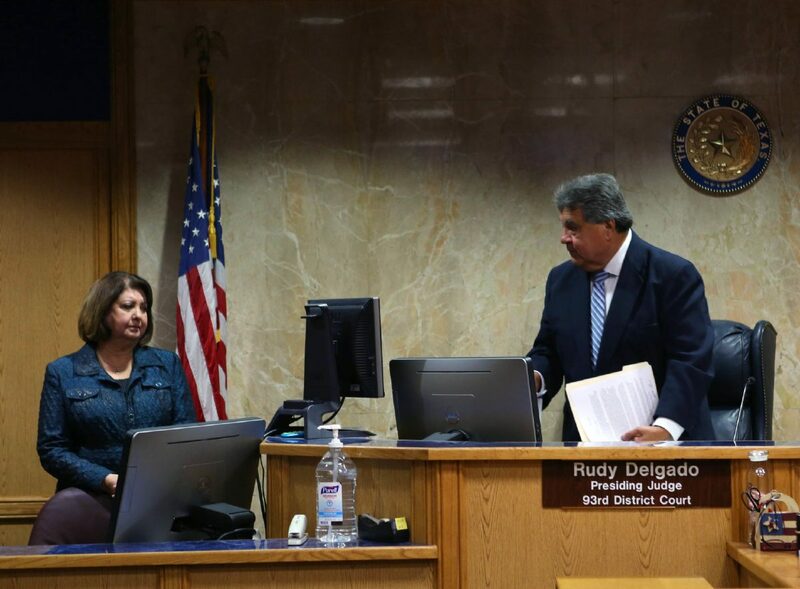 Roldofo "Rudy" Delgado turns towards his wife, Diana Delgado, after announcing his resignation as judge of the 93rd state District Court Monday, April 30, 2018, at the Hidalgo County Courthouse in Edinburg. Delgado has been charged in federal court for allegedly accepting bribes on cases. 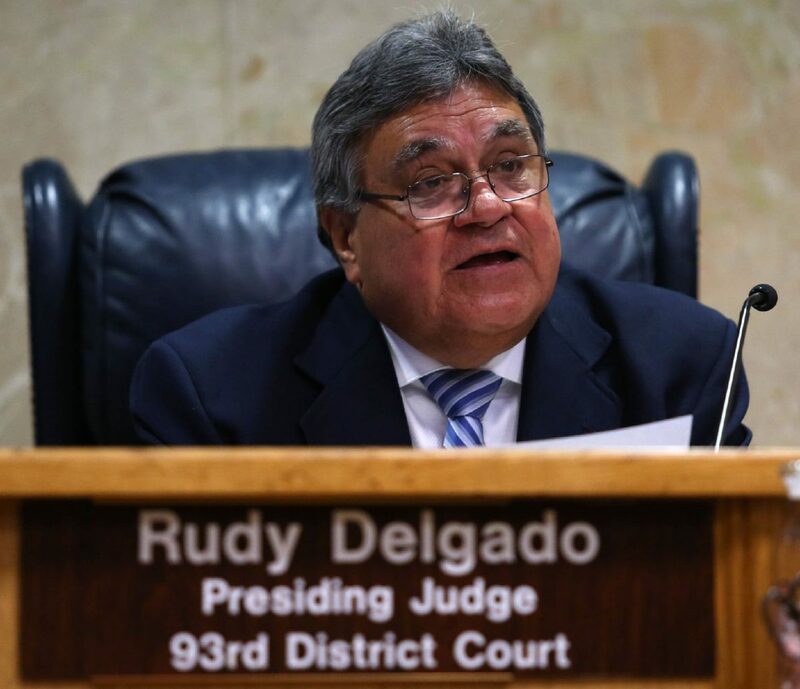 EDINBURG — State District Judge Rodolfo “Rudy” Delgado is retiring and resigning effective immediately, he announced Monday during a news conference held in the courtroom he headed for nearly two decades. The announcement comes two months after a federal grand jury indicted him on three counts of federal bribery and three counts of violating the federal Travel Act, charges to which he pleaded not guilty. “I believe it is in the public’s best interest that the 93rd District Court continues to operate,” Delgado said in a letter he read aloud to those in the courtroom, which included a handful of attorneys and members of the media. 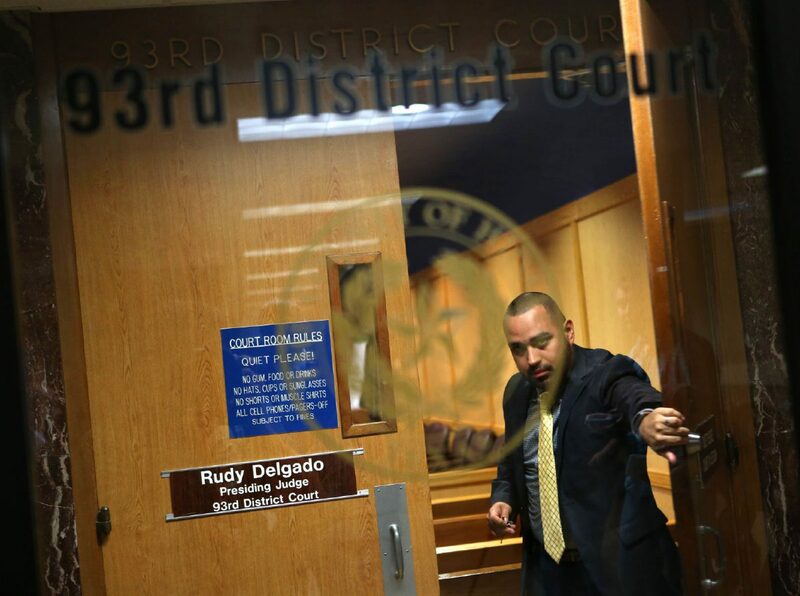 93rd state District Court bailiff Cesar Perales closes the doors to the court room after Roldolfo "Rudy" Delgado resigned as judge of the court Monday, April 30, 2018, at the Hidalgo County Courthouse in Edinburg. Federal investigators allege Delgado, 65, accepted approximately $6,000 in cash bribes from a local attorney between November 2016 and January 2018 in exchange for setting bonds for three clients accused of violating probation. Delgado may face additional charges, according to a motion for continuance his attorney filed earlier this month, which noted that federal prosecutors had informed them that “a superseding indictment is possible.” Such an indictment, which replaces the original, could include new charges, different charges or additional defendants. “I must now devote my time and energy to assist my defense team,” Delgado said. His trial in Houston’s federal court is tentatively scheduled for early September. Delgado — who was first elected to the 93rd District Court in 2001 after having served as a county court-at-law judge for 11 years — had been suspended without pay since his indictment. Visiting judge Robert Garza has presided over the court in the interim. A special election will determine who will fill Delgado’s seat for the remainder of his term, which ends in 2020. That election will take place in November, and precinct chairs for the Democratic and Republican parties will each be tasked with nominating a candidate. The earliest the nomination process could take place is in June after the new precinct chairs take office, said outgoing Democratic Party Chair Ric Godinez. A few people are already lobbying for the Democratic Party nomination, Godinez said, among them former district court judge Fernando Mancias and local attorneys Orlando Jimenez and Ted Lopez. Attorney Patricia “Patty” Y. O’Caña-Olivarez’s name has also been tossed around as a possible nominee, he added. “I’m even considering it myself,” Godinez, an attorney, said of lobbying for the nomination. Delgado took no questions during his news conference and did not address whether he will remain in the race for a seat on the 13th Court of Appeals. Delgado ran unopposed for the appellate court’s Place 4 seat, securing the Democratic Party candidacy for the November general election against Republican Jaime Tijerina, who is the assistant city attorney for Mission and a former district court judge.